At around $50, the Healthy Juicer – Manual Hand Powered Wheatgrass Juicer is a very affordable machine. The manufacturer claims that this juicer is not only one of the most affordable juicers on the market but that it is also one of the easiest and most efficient. They claim that it is rugged and easy to clean. The Healthy Juicer – Manual Hand Powered Wheatgrass Juicer grinds and squeezes juice out of wheatgrass rather than using rapidly rotating blades like a centrifugal juicer. It is believed that this grinding and squeezing process preserves more of the nutrients and natural enzymes that can be destroyed by the heat created with a centrifugal juicer. The Healthy Juicer – Manual Hand Powered Wheatgrass Juicer is compact and lightweight which makes it great to take with you if you are traveling. All of the parts are made of polycarbonate and are FDA approved, non-toxic. Click Here to see price on Amazon. Patented suction base is rated at over 100lbs of force. The reviews for the Healthy Juicer – Manual Hand Powered Wheatgrass Juicer are very mixed. There are approximately 200 user reviews online and this product received an average user rating of just 3.7 out of a possible 5 stars. The people that left positive reviews do feel that the Healthy Juicer – Wheatgrass Juicer is easy to use, easy to clean and does a good job of making juice. One customer said that the waste material is fairly dry and that is a sign that the juicer is efficient and is in fact extracting all of the juice. This person also said that dismantling the parts and cleaning the machine is very easy. Another reviewer said that although this product is a “wheatgrass juicer” they are able to juice oranges, apples, grapes and cabbage. Another person that left a positive review said that the Healthy Juicer – Wheatgrass Juicer is an outstanding product for the price and is perfect for small kitchens. 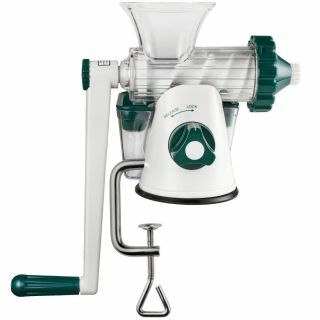 This juicer is a manual juicer and you have to operate a handcrank but the people that are leaving positive reviews say that the handcrank is not difficult as long as you don’t overload the unit. Although there were a good number of positive reviews there are also quite a few negative reviews. A number of people said that they had problems with the juicer breaking. One customer said that the hard plastic auger that squeezes the juice from the wheatgrass cracked after about four days of use. Another person said that the plastic base cracked after about two weeks of use. There was another customer that left a positive review initially but they came back three months later to edit their review after the crank arm broke. In their first review they said that the Healthy Juicer – Manual Hand Powered Wheatgrass Juicer is low-cost, quiet and Earth friendly. They liked the fact that the clear plastic construction allows you to see the fruits and vegetables being processed. They liked this juicer in the beginning and they were very disappointed when it broke after three months. One of the most common complaints was that the crank arm is cracking so if you do purchase this juicer, make sure that you do not put too much material in at one time. Hopefully if you take it easy on the machine the crank arm will last longer. Hi welcome to the Roos family's cooking blog. My name is Jan and my wife's name is Talisha. We like to cook mostly healthy meals for us and our two boys Talan and Mason.